We're in the homestretch. Memorial Day weekend is just days away, and hopefully that means you're lucky enough to score a three-day weekend in the sun. Summer may not officially kick off until June, but that doesn't mean the lake and pool are off limits. So to get you started, I thought I'd share some of our best-selling sunglasses for ladies. First up we have these PersolSunglasses (Style PP0714). This has been a popular choice because of their clever, foldable design, making the pair the perfect travel companion. (Watch them fold here!) Whether it is in your purse or your weekender these handmade sunglasses go anywhere you can fit them. Second, we have these Ray-Ban Erika (Style RB4717) Sunglasses. This rubber frame has been a go-to pick for ladies because it's actually a lightweight, hypoallergenic propionate nylon. In other words, it's resistant to warm weather. The color of the beach also helps tie in the summer vibe and looks great with shades of blue or aqua. Maybe you're more of sipping cocktails by the pool kind of lady? Well, these jet-black Prada Sunglasses (Style PR 17OS) could be just what you're looking for. These glamorous shades add just the right amount of classic with a dash of poolside luxury. Next, we have these Dolce & Gabbana (Style DG4207) Multi-color Sunglasses. A brand known for creating collections with the essence of the Mediterranean, you can feel like you've been whisked away on your dream vacation. The flattering shape has just a touch of color on the temples to add a little pop of interest to your ensemble. Lastly, we couldn't leave out one of the hottest items on our site the Ray-Ban Round Metal Sunglasses (Style RB3447). 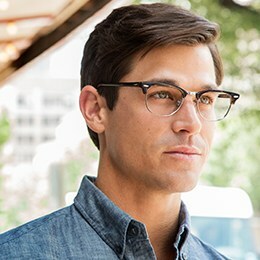 This unisex frame has been seen on celebrities including: Sienna Miller and Kate Moss. It walks a fine line between retro and modern and is sure to be a staple this summer. Didn't fall in love with any of these shades? No problem, we have tons more.